Ready Set Stack! is a great early learning app that encourages children to practice their hand-eye coordination while they stack various rings while learning new vocabulary words and colors. With the narration option throughout as children tap various images and rings, this app combines audio and visual learning which is great for young children. Ready Set Stack! 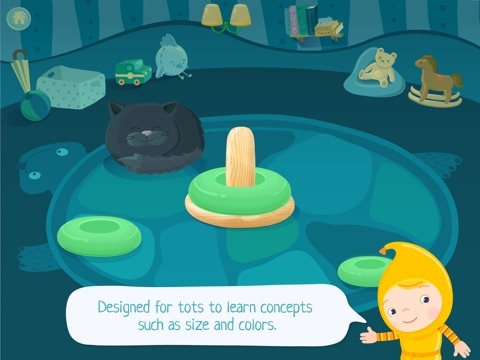 is a great early learning app full of bright colors, fun illustrations and sound effects that encourage children to stay engaged and learning. While the app uses simple drag and drop technology as well as simple tapping to interact with the illustrations, it does require a bit of extra assistance from parents. 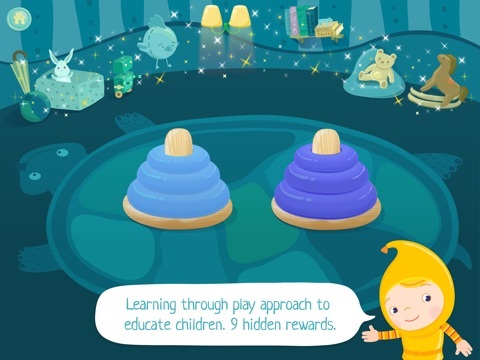 The concept of dragging the rings to the peg appropriately isn’t fully explained within the app and the developers encourage parents to enjoy the app with their child to help them as they play and learn. Overall, this app is well done and a great early learning tool for children. This simple app has so much to offer in terms of educational value that it’s hard to believe. Not only are children working on hand-eye coordination as they stack the rings accordingly, but they are also learning new vocabulary words and colors as they play. Every time an image or illustration is touched the narrator will say the word out loud. When the rings are tapped and dragged into place, the color of the ring is said out loud creating an opportunity for children to practice recognizing their colors. As the difficulty level naturally progresses, children are then asked to stack two different color rings on separate pegs which teaches the concept of sorting. There is also an opportunity for children to stack based on size (largest to smallest) and so on. The natural progression of the difficulty is nice as it provides a very organic learning environment that children will enjoy. 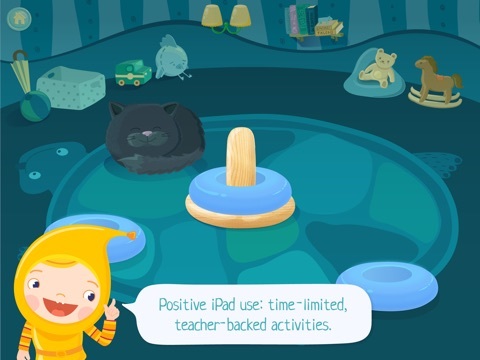 Another great feature is the ability for parents to set up a timed playing option so children can get breaks from learning regularly depending on parents preference. While there aren’t specific games in addition to the educational material, there are fun little interactive images and toys in the background of the playing screen that children are encouraged to tap and touch after they complete a sequence. This encourages players to continue playing and learning. There is also a celebratory animation that pops up in the bottom of the screen once each sequence is complete that adds a bit of excitement to the app. 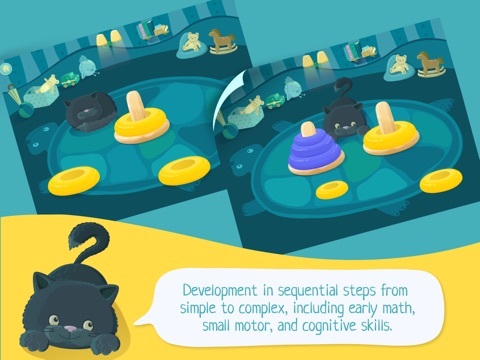 While adding an additional activity could be more of a distraction, this app could use a bit more entertainment within the educational material. Even adding a sticker reward of sorts would help keep children more engaged. There is no doubt this app is a great value since it is absolutely free. There are a ton of great educational components within the app and not having to pay a dime for all that is a steal! Parents will certainly love all you get in this app for free. Ready Set Stack! 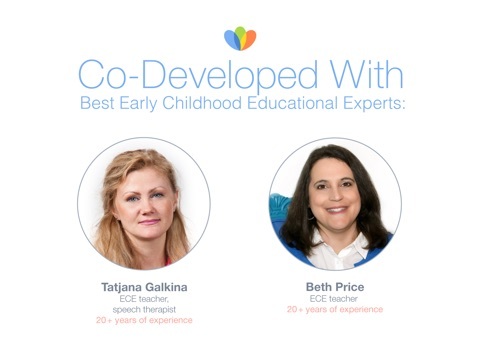 is an easy to use early learning app that is great for children. With simple drag and drop technology, parents can easily teach players how to move through the app as they learn lots of great skills. And while the app is child friendly with protected links etc. it could use an additional layer of protection by requiring a password upon entry to the ‘other apps’ buttons etc.